Silk Hand embroidered Bag. Customization entertained. Beautiful embroidery of figurative designs adorns the top edge of bags as well as upper of backless mules to be worn with matching apparels stylishly. 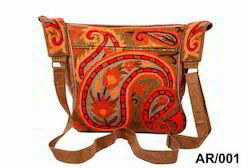 Description: Embroidered Shoulder bag with pure leather trims in messenger bag style, antique tribal embroidered panels from the body of the bag. Flap is in hot pink as is the shoulder strap. Interiors lined in polyester and all pockets trimmed in leather consist of zipped compartment, zipper & slip-in pocket. - 18 inches.The bag has one inner pocket with zipper. Embroidery is present on both the sides. - Cotton handmade banjara style Patch work embroidered clutch purse. It has both side fully embroidered and coin work .It is decorated with handmade KODI work tassel (latkan) and thread string handle.It is carry Note, I-pad and big size mobile handsets. Best Suitable for Casual, Fashion, Party, Collage and Office. 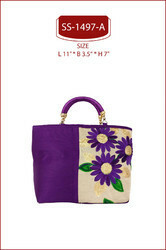 We commence our business as the leading organization of the best quality Hand Embroidered Shoulder Bag.